Some take theirs plain, toasted, with butter and salt. Others, everything, cream cheese on the side. Lox and tomato, for the classicists; cinnamon raisin, for the sweet-toothed. Peanut buttered. Chocolate chipped. Scallion cream cheesed. Blueberry jammed. Scooped out, toasted, schmeared with the works, or unadorned, uncut, and later, with bite marks. Me? Oh, don’t sweat it. I’ll take mine homemade. While some bakers delight in the delicate crumb of the perfect cookie, bask in the beauty of a three-tiered cake, I grin in the glory of a perfectly formed loaf. I’m taken with tackiness. I’m excited by elasticity. I’ve got a thing for yeast. It’s this fascination, this infatuation, that drives me to bypass every bagel store, bakery, roadside cart. It’s what leads me to the metal bowl, to the bread flour, to the big ol’ jar of barley malt syrup (the key to these bagels). Floured hands, elastic dough: one step closer. Yeasty perfection, here I come. When these little guys emerge from the oven, after an overnight snooze in the fridge and a bath in boiling water, you’ll be just as excited as I am. These aren’t the blond, doughy boys you get from the bagel store on the corner. These have some chew. These have some nooks, some crannies. These guys have got character. Since these do need to proof overnight, start the dough a day (or two) before you intend to bake them. Mix, knead, shape, stick them in the fridge, and do whatever it is you feel like doing. Study. Watch TV. Throw a party. And know that you have an insanely good breakfast waiting for you the next morning. The key to this recipe? Enjoy it. Enjoy the process. Enjoy the burn of your biceps as you start the mixing (They’ll scream: “I wish I had a dough hook.” Ignore them.). Enjoy the feeling of the gluten beneath your palms, the way it stretches, the way it morphs (it gets me every time). And, finally, enjoy those bagels. I know you will. You can find barley malt syrup at a specialty foods store or Whole Foods. Stir the malt syrup, yeast, and salt into 1 cup plus 2 tablespoons lukewarm water. Place the flour into a mixing bowl and pour in the malt syrup mixture. Use a large, sturdy spoon and stir for about 3 minutes, until well blended. The dough should form a stiff, coarse ball, and the flour should be fully hydrated; if it isn’t, stir in a little more water. Let the dough rest for 5 minutes. Transfer to a very lightly floured work surface and knead by hand for about 3 minutes to smooth out the dough and develop the gluten. The dough should be stiff yet supple, with a satiny, barely tacky feel. If the dough seems too soft or overly tacky, mix or knead in a little more flour. Place the dough in a clean, lightly oiled bowl, cover the bowl tightly with plastic wrap, and let the dough rise at room temperature for 60-90 minutes. Patience is key. When you’re ready to shape the bagels, prepare a sheet pan by lining it with parchment paper, then misting it with spray oil or lightly coating it with oil. Divide the dough into 6 to 8 equal pieces. Poke a hole through the center of each ball to create a donut (or bagel, duh) shape. Holding the dough with both thumbs in the hole, rotate the dough with your hands, gradually stretching it to create a hole about 2 inches in diameter. Place each shaped bagel on the prepared sheet pan, then mist with spray oil or brush with a light coating of oil. Cover the entire pan with plastic wrap and refrigerate overnight or for up to 2 days. (You can also proof the full piece of dough in the oiled bowl overnight and then shape the bagels on baking day, 60 to 90 minutes before boiling and baking them). Remove the bagels from the refrigerator 60 to 90 minutes before you plan to bake them. About 30 minutes before baking, preheat the oven to 500°F and gather and prepare your garnishes, if using (seeds, onions, garlic, and so on). 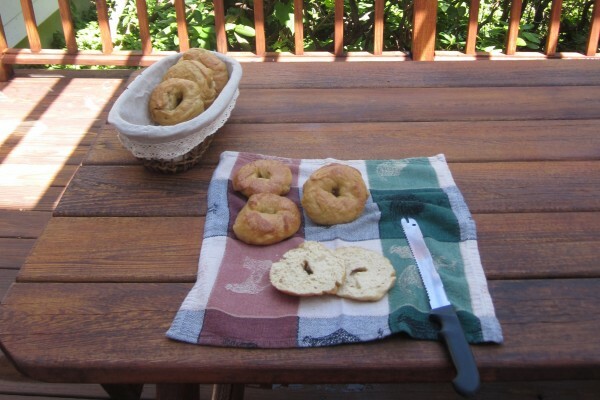 Check whether the bagels are ready using the “float test”: Place one of the bagels in a small bowl of cold water. If it sinks and doesn’t float back to the surface, shake it off, return it to the pan, and wait for another 15 to 20 minutes, then test it again. When one bagel passes the float test, meaning they rise to the surface, they’re all ready to be boiled. Fill a pot with 2 to 3 quarts of water, making sure the water is at least 4 inches deep. Cover, bring to a boil, then lower the heat to maintain at a simmer. Stir in the malt syrup, baking soda, and salt. Gently lower each bagel into the simmering poaching liquid, adding as many as will comfortably fit in the pot. They should all float to the surface within 15 seconds. After 1 minute, use a spoon to turn each bagel over. Poach for another 30 to 60 seconds, then use the spoon to transfer it back to the pan, domed side up. (It’s important that the parchment paper be lightly oiled, or the paper will glue itself to the dough as the bagels bake.) Sprinkle on a generous amount of whatever toppings you like as soon as the bagels come out of the water. Transfer the pan of bagels to the oven, then lower the oven heat to 450°F. Cool on a wire rack for at least 30 minutes before slicing or serving. Take a bite. See, wasn’t that worth it? I thought I was the only one who cooked when I procrastinated! Ha The irony in it is quite humorous I have to try this recipe! Thanks for such a great recipe! I made these for Yom Kippur break fast and they turned out way better than I thought they would!